We are pleased to share "Snow White" from the Madame Alexander Collection. 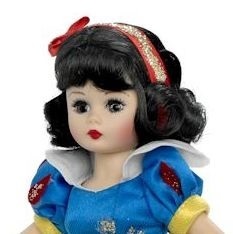 This is a 10-inch bent knees Snow white with brown eyes and long black curls worn with bangs and adorned with a red satin headband. 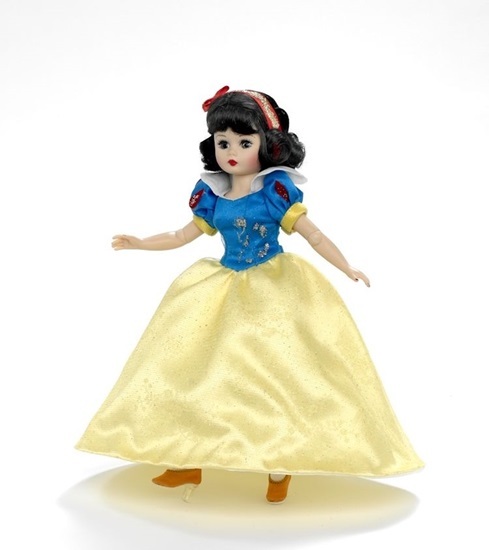 She is dressed in her classic gown, which consists of a blue satin bodice, layered with blue glitter tulle, and a yello satin, full skirt that sparkles with a layer of yellow glitter tulle. Blue satin puff sleeves with yellow binding and red velvet appliques add dimension and colore to the bodice. A white taffeta petticoat and pantaloons, white knit stockings, and red satin pumps, with clear heels, completes Snow Whites classic ensemble.